Woodland Mansion Next to Spawn Seed – one of such places. It would seem that you have seen a lot of natural beauties in MCPE. But still there is always something that you have not seen and where you have not been. 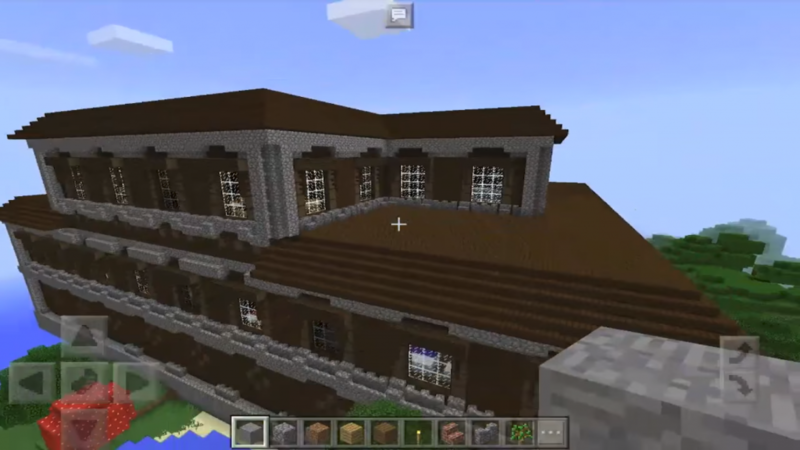 In the world on the Minecraft there was already a hundred if not more huge mansions. This will be special, because it is made entirely of wood and is located in a picturesque place. There is a mansion near the spaun, but still a little pass you still need to be. You will take a walk (about 100 blocks) and quickly come to your destination. There are several other similar sideways, but this one deserves special attention. Once you have slept, make a right turn and go through the thick forest to get to the Woodland Mansion. The Woodland Mansion is the largest randomly created structure in MinecraftPE and has many beautiful rooms. You must visit them and find out what they are so good at. In one of the rooms you will meet a cat, another room is a large living room, dining room and so on. Wherever you went and that did not study – everything is interesting and informative. Seed a wooden mansion near spawn is a great way to learn the world of Minecraft Poket Edition better. At the spawn site, be very careful. Dangers as such are not there, but you still can not lose vigilance. As in the study of all rooms.